Since 1989, Stern has developed and manufactured electronic faucets and flushing devices operated by infra-red sensors which are marketed all over the world. Stern has been offering basic Piezo solutions for several years. Around two years ago, Stern decided to take on the Piezo technology as one of their core competences, investing in developing new and innovative Piezo products and starting in-house production of the Piezo technology. Stern manufactures high-tech piezo based products designed for industrial control panels such as keypads and keyboards as well as industrial switches that are needed in severe environments. As a piezo manufacturer with industrial needs in mind, Stern’s products are durable and long lasting. The company is guided by the need of its piezo products to be water, weather and vandal proof in order to fit in outdoor projects. 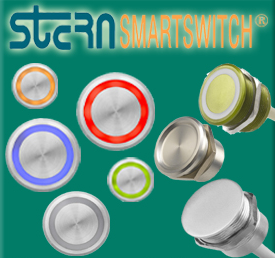 Stern's Smartswitch Piezo switches line, offers advanced technology in a high finish. Stern switches can be used in outdoor machines like fuel pumps, car wash stations, weighing stations etc, where they are exposed to harsh weather conditions. In applications where there is no need for machine status indication, Stern's non-illuminated range is advisable. Ring or dot illuminated switches, provides an advanced user interface in the form of visual operation-feedback or switch mode indication, and are advisable for more advanced applications. The programmable Piezo switches family represents a range of switches operated by touch and featuring various time-delay and automatic activations functions. Based on the basic Piezo switch, the programmable Piezo switch is an integral solution for any practical switch activation market.The Smartswitch keyboard is a one piece construction, to which individual switching units are added. It is than potted at the back of the panel, and is anodized printed. As a result, it has a perfect seal against water, can withstand harsh weather conditions, and is vandal resistant. Stern's Smartswitch Piezo keypad is a one piece construction allowing maximum durability.It is designed and manufactured to be used in rough outdoor environments and can withstand extreme weather conditions. 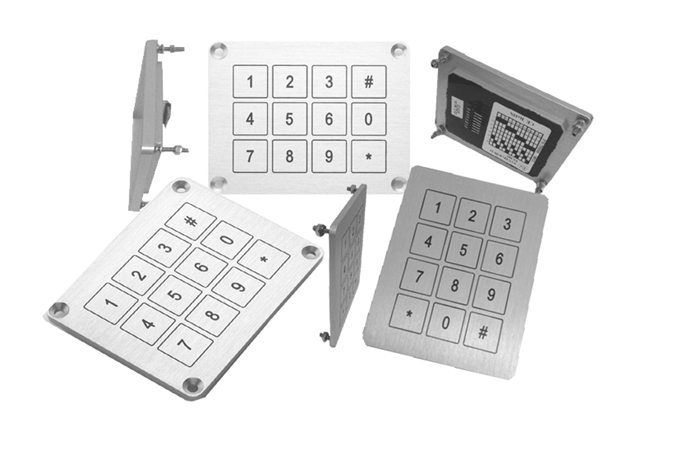 With a flat surface and with no moving parts, Stern's Smartswitch keypad is ideal for versatile access control solutions, fuel pumps etc.The Smartswitch keypad is a one piece construction, to which individual switching units are added.It is than potted at the back of the panel, and is anodized printed. As a result, it has a perfect seal against water, can withstand harsh weather conditions, and is vandal resistant. Piezo keyboards: Stern's Smartswitch Piezo keyboard is a one piece construction allowing maximum durability. It is designed and manufactured to be used in rough outdoor environments and can withstand extreme weather conditions. With a flat surface and with no moving parts, Stern's Smartswitch keyboard is ideal as an integral part of operators panels across numerous industries, such as food processing conveyer, fuel management systems, mining equipment etc.